Crepes, Crepes, and More Crepes! Yep, that’s right. We ate crepes three times (actually I ate them four times!) the last two days. On Sunday morning we went to breakfast with some friends from Seattle and I had super delicious apple crepes. As soon as we got home I knew crepes would be the challenge for this weekend. Since we ate them at a cafe in Santa Monica I have been dreaming of crepes filled with ham and cheese followed by one filled with chocolate and strawberries. First, though, I had to learn how to make the actual crepes. Luckily crepes don’t require any strange ingredients so we didn’t have to go to the store first. In a large bowl whisk together: 4 eggs, 1 1/3 cup milk, 2 Tbsp melted butter, 1 cup flour, 2 Tbsp sugar, 1 tsp vanilla, 1/2 tsp salt. Whisk until smooth. If you are having a hard time getting rid of lumps you can transfer the batter to a blender and mix it that way. Or, just mix the whole thing in the blender to start with! Heat a medium sized skillet (one with low edges) or a crepe pan, lightly greased with a little butter, over medium heat. Spoon a small amount (about 4 Tbsp) of batter into the skillet. Tilt the pan so the batter spreads out across the bottom of the pan. You have to do this fairly quickly because the batter starts to cook pretty fast. 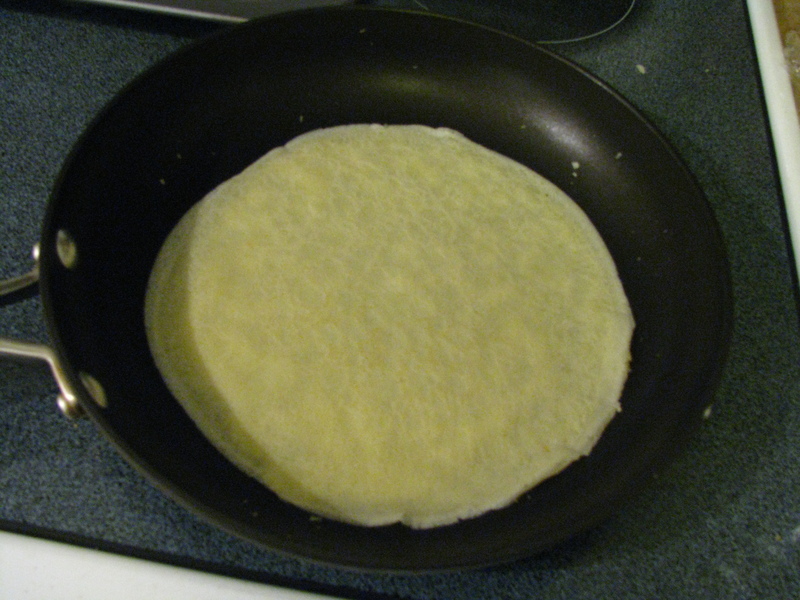 Cook the crepes until they are light golden brown on each side, about 1 minute on each side. Monday morning we ended up spreading raspberry jam on them with a little sprinkling of powdered sugar. It was really tasty! 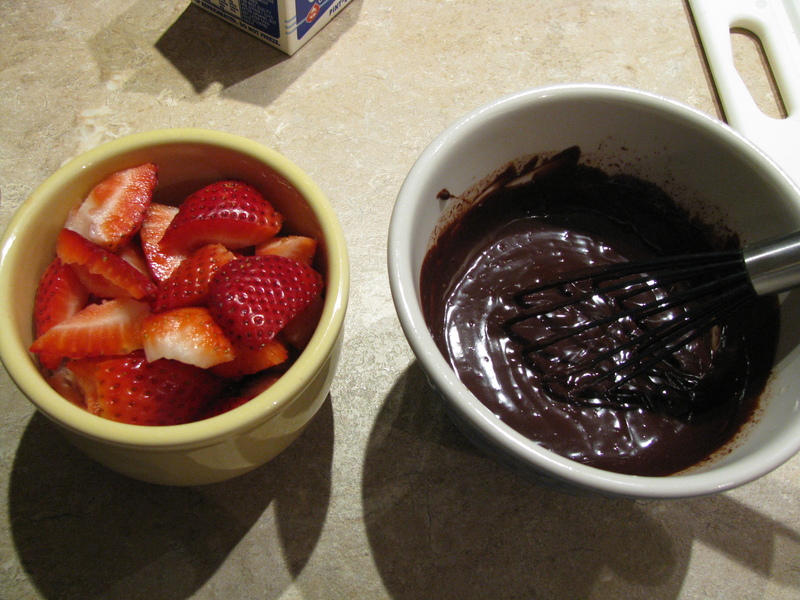 After dinner (delicious flank steak from Trader Joe’s) I made a chocolate ganache (1/2 cup milk brought to a boil in the microwave and them poured over half a bag of semi-sweet chocolate chips and whisked until smooth) and chopped up some strawberries. 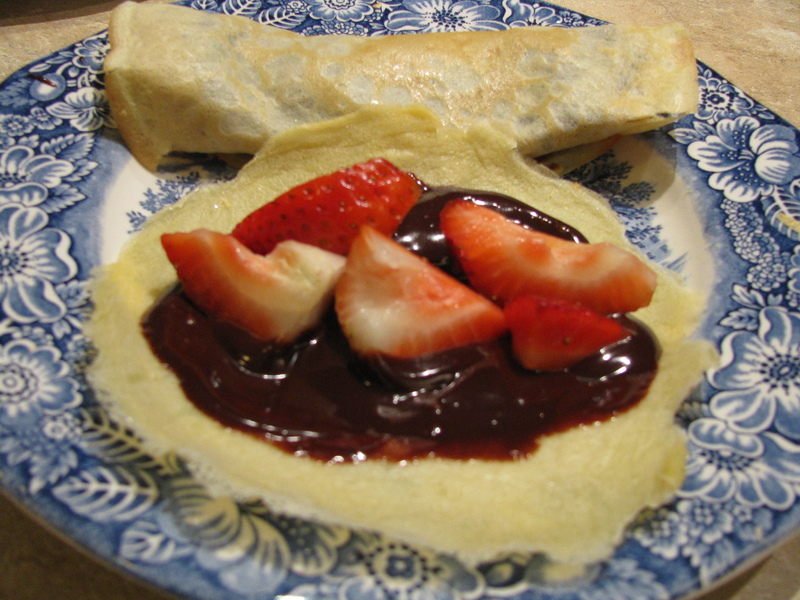 Then I cooked up some more crepes and filled them with chocolate and strawberries. When I say they tasted like heaven, I’m not exaggerating. So yummy I dreamt of them last night. 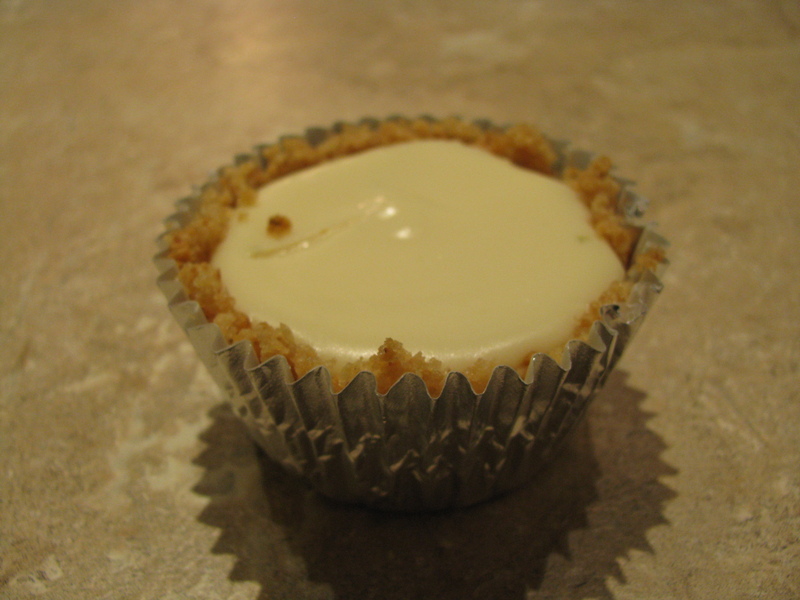 Before I made the chocolate and strawberry crepes I made miniature Key Lime Pies. Isn’t this one cute!? I still had some crepe batter left over so I covered it with saran wrap and stuck it in the fridge (you can keep it like this for about 2 days). 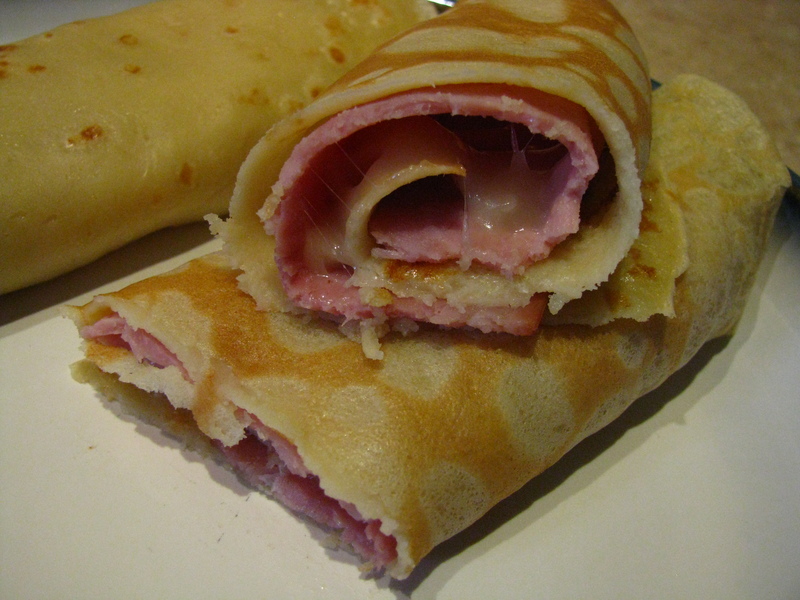 This morning I heated some smoked ham from the deli and grated some monterey cheese to fill the remaining crepes. Oh so good! 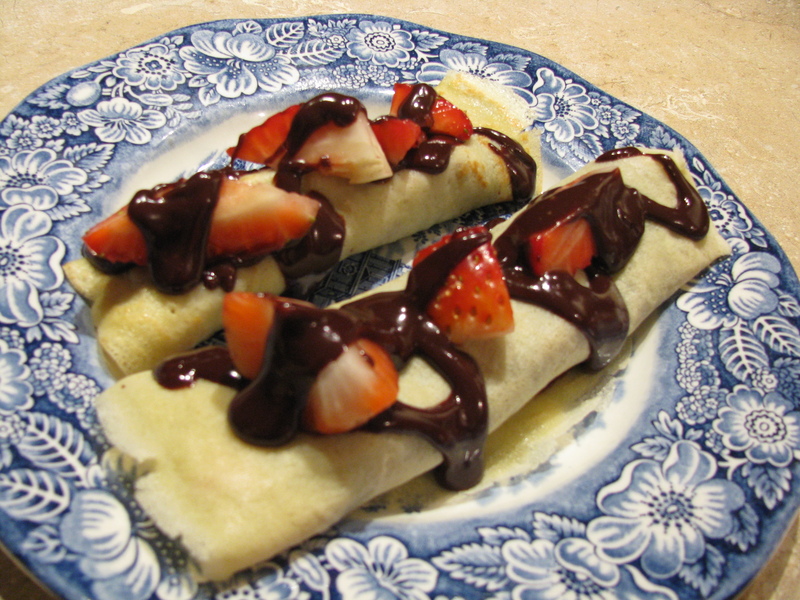 If you are ever in need of a quick, easy meal I can highly recommend whipping up some crepes and filling them with whatever kind of yummy stuff you have around. You won’t be disappointed! Categories: Baking, Cooking, Delectable Dabbling, Food, Savory, Sweets | Tags: breakfast, crepes, dessert, ganache, key lime, strawberries | Permalink.